good health, lots of love and grateful hearts! their 40th anniversary! It is hard to believe! little package to put their reservations in! I fell in love with this Cottage Cutz Poinsettia Shape from the Winter Wonderland Release the moment I saw it! I love all the layered leaves because it really allows you to customize your flower how ever you would like and is just such a true to life representation of a poinsettia. I was working on this Trimming the Tree layout and I thought the poinsettia shape would make such a lovely addition to the layout. See, I always decorate with poinsettias each year, but they don't necessarily make it into my Christmas photos because of where they tend to be placed (bathrooms, foyer, that kind of place). So by adding the poinsettia die cut to my layout about decorating the Christmas tree, it reminds me of the poinsettias that are all around us but you just can't see them in the pictures. I hope everyone has had a chance to start looking over your Christmas pictures so you know which Cottage Cutz dies you need to add to your next order to go with all of your upcoming holiday layouts!! special time of the year in so many ways. white picture the old fashioned way! to be. It is subtle but adds a like flair! your wonderful work our way!!! As the Christmas season comes to a close I find it so handy to have a few thank you cards on hand to give to those people in my life that have touched me this holiday season. 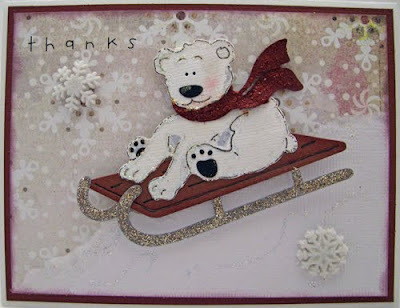 This CottageCutz Polar Bear on Sled die is perfect. I used a little chalk for his cheeks, a fine tip Zig pen to add some details around the edges, a gray Copic marker for some depth and lots of Stickles on his scarf, around the edge of the bear and on the sled and a bit on the snow hill. This die would also be great for a winter birthday card, not to mention all those snowy winter layouts. Join us tomorrow for Rochelle's Watch for it Wednesday post! This year for my Mother's birthday, my brother and I "bought" her Santa to come to her annual Christmas party - the real Santa! This guy was amazing!!! He just embodied Santa. And it was an extra good present for me because I was able to get some wonderful photos of Santa with my girls. 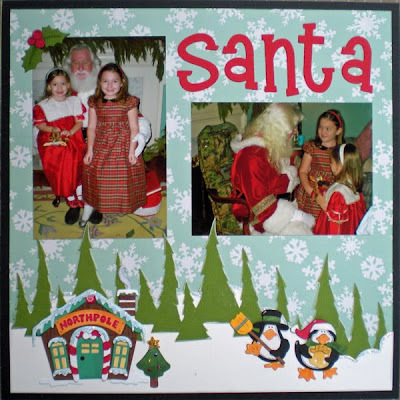 For these pictures, I wanted to create a layout that was different than just the ordinary sitting-on-Santa's-lap layout. As I started looking through my Cottage Cutz, I got the idea of doing a North Pole kind of scene as the perfect background to my special Santa pictures. 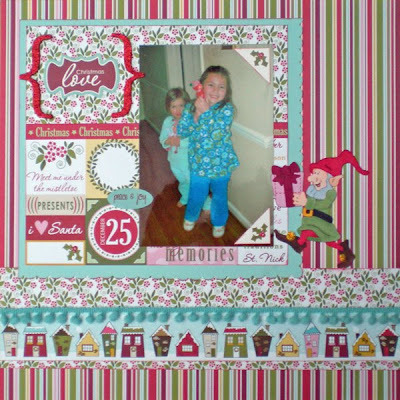 I borrowed an idea from one of Natasha's layouts where she cut this tree border and layered it. I loved how she did it and always wanted to try it out on one of my own layouts. I used the Cottage Cutz Elf Workshop as well as these adorable little Cottage Cutz Festive Penguins. These little penguins were so fun to put together!! I think they are a must have for any Winter layout. This was definitely one of those dies that I am so glad I got because it is so much cuter when you have it in your hands and start thinking of all the different things you can use them for! The Cottage Cutz Mini Holly shape is absolutely the perfect decorative photo corner! I could see putting this holly on all kinds of different things for just a little added flair. I also used the Cottage Cutz Mini Christmas Tree to add to the Elf Workshop. Be sure to click on the layout so you can get a close-up of the Elf Workshop and Festive Penguins. I hope everyone has a very Merry Christmas!!! CottageCutz Moose with hat. The rest of the year I simply leave off the santa hat and he's great for those camping/hunting projects. I feel like we have sort of reached a milestone with our 40th Watch for it Wednesday post! I guess 50 will really be exciting!! My post today is a memory preserving kind of a tip. I think around the holidays more than any other time, you end up taking a lot more pictures in a much smaller period of time, am I right?? Every family gathering big and small, parties, children's pageants, you name it - the photo ops during this time of year way out number the scrapping hours available. Sometimes, us scrapaholics can get bogged down by wanting to scrap every single picture we have in order to truly commemorate the holiday season. If you have that kind of time and patience, go for it!! But for the rest of us, we need another system. What you need to remember is that there is a difference between a scrapbook and a photo album. Photo albums exist so you can print every picture you took of each and every Christmas present and proudly display it in the album. But scrapbooks are for telling the stories and the memories behind the pictures you see. That's why we scrap, right?! To tell and preserve the stories. I want to share with you something I have started doing for my Disney album which I think would also work great for these holiday times. Why not have a combination scrapbook/photo album?! There are no rules saying you can't have layouts and photo pages in the same album!! In my combination Disney album, I scrap the pictures I want, and then in between the layouts, I include photo pages filled with all the "extras" that go along with the story of the layout. For instance, I scrapped a page detailing a parade we watched in Magic Kingdom. Then following that layout, I added photo pages to hold all of the parade pictures I took. It is like the best of both worlds, plus it keeps all of my pictures and stories together in one place. I hope this tip has been interesting and has inspired you to stay "caught up" this holiday season! 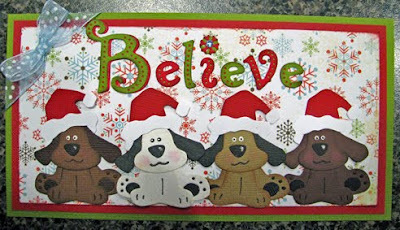 The minute I saw this CottageCutz Dog w/Santa Hat die I knew what I wanted to do with him - make lots of different colored dogs. Isn't he cute?? This CottageCutz Believe Phrase die is also a fun one - I ran it through my Revolution with green and red cardstock and one more time for the extra "e" and I had all the letters I needed. It has the solid letters as well as the ones with the holes so you don't have to keep cutting it out or worry if the holes pop out while cutting. I used a tiny stylus to punch out the tiny holes and glued that letter to the solid one. For the "B" I also mounted it on an extra red "B" for added emphasis. I used a little distress ink and one little gem for the "i". 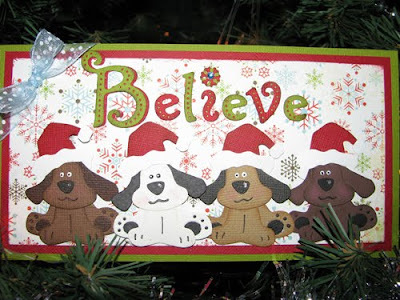 These are both 3x3 dies and remember the dog can be used all year round as he's complete even without the santa hat. His ears are all one piece which makes him so simple to put together. I cut these dogs out of one color and then colored in his ears, nose and spots with my Copic markers. We'll see you back tomorrow for Ruth Ellen's Watch for it Wednesday post! I wonder if every little boy loves trains as much as my little grandson. He knows all the names of the Thomas the Engine trains. So, hopefully this will be the perfect little book to help capture his Christmas memories. 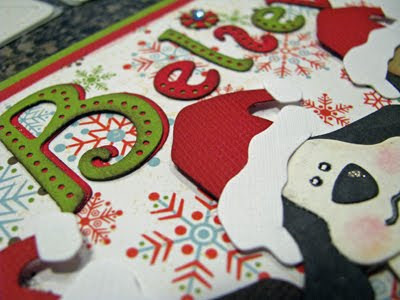 I am using the Cottage Cutz Holly Jolly and Winter Wonderland minis to help me embellish this fun book. On the front page, I used the Cottage Cutz Holly Berry. 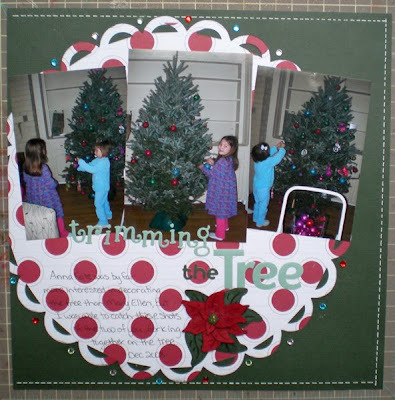 For the second page I used the Quickutz Revolution Train and the Cottage Cutz Santa Hat mini. This will be my next page. I used a circle punch to make the wheels and then used some sliver stickles for the center of the wheel and gold stickles for the back light. 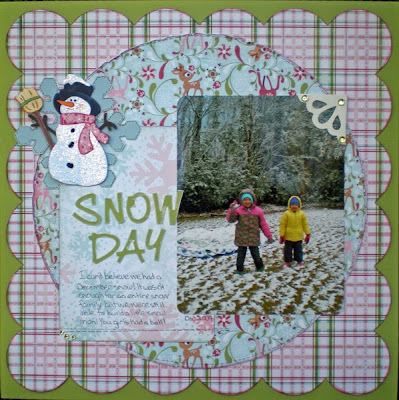 The Cottage Cutz Snowman mini is so cute, I used it on this page. I am working on this train book daily. I sure hope I can finish it before Christmas........ Have a wonderful, exciting and fun filled day...Merry Christmas!!! Sooooooo.................I am loving these Cottage Cutz Elves from the Holly Jolly Christmas Release!! They are so cute and SO much fun to put together!! 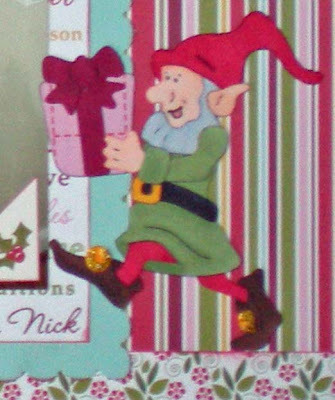 I especially love the little bells on the shoes of the CC Elf with Present Shape. Another great Cottage Cutz touch!! I added gold stickles to the bells to really make them shiny and fun. Doesn't he just look like is running across the page! If you haven't ordered your Christmas Cottage Cutz shapes, you don't know what you're missing!! but I love Christmas most of all! Today's Watch for it Wednesday is a pretty quick and easy tip. 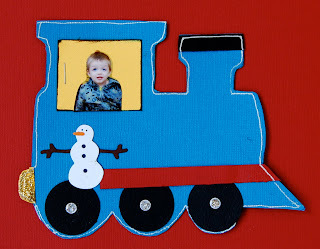 When you want to make snow on your layout or card all you have to do is take some white cardstock and tear off a strip, trim the sides to the size you need and apply it to your project. You can tear several strips and layer them for more depth. You can ink it with lt.blue ink or add glitter or Stickles to make it shine. You can also use tan or Kraft cardstock and make sand the same way. I find it kind of interesting that the blog team has a tendancy to pick the same dies to work with. 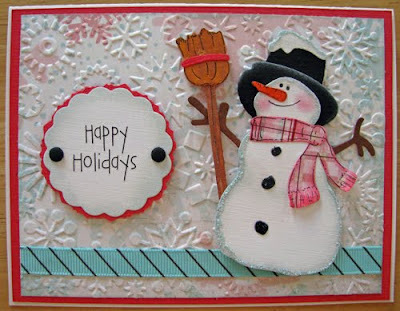 When Ruth Ellen posted her Snow Day layout last week I thought "here we go again" because I knew I would be posting this card with the same Snowman w/broom die. He's so cute and such as basic snowman to have in your die collection. I used Copic markers, a fine tip Zig pen, Baby blue & Black diamond Stickles, some pink chalk for the cheeks and white Memento ink to shade his hat. I also inked around the scarf and cut some slit marks at the bottom for some fringe. 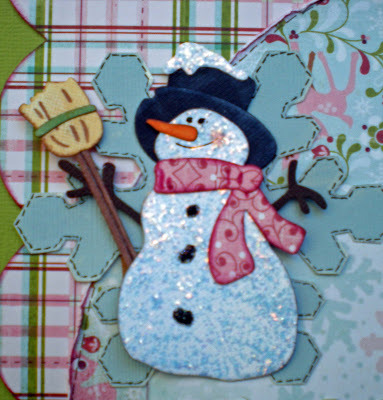 You'll want to add this die to your collection - he's great for the holidays and your wintertime projects. I love making Christmas books for little grandsons. This year I am making a BELIEVE album to help cherish this years Christmas memories. I used the Cottage Cutz Santa with reindeer along with several Christmas dies to embellish this book. 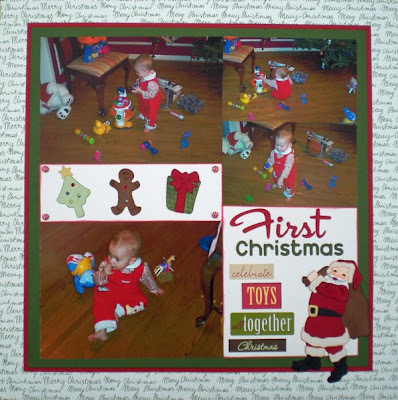 It is a work in progress and I will be adding Christmas pictures and other dies. I also tied different colors of ribbon on each of the rings. comes but once a year!!!! To really bring this snowman to life, I cut him out of white cardstock and then covered the cardstock with Icicle Stickles. 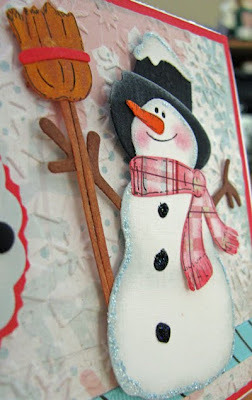 The reason I did it this way instead of just using glitter cardstock, is that I knew that as the Stickles dry, they will curl up the paper a little bit which would give my snowman a more 3-D feel. I also used black stickles for his eyes and buttons. I used my Copics and chalks to outline the body and to add a little rosy cheek before I added the stickles. You can choose whatever color or patterned paper you want for his scarf to really personalize his outfit to your layout! I'll have to make a layout next of our little snowman that we built - although I will probably need the Cottage Cutz Mini Snowman for that one!! ;) You can see how much we had to work with for our snowman! Welcome to Watch for it Wednesday. For today's project you will need the following items, Distress Crackle Paint, Distress ink and the item you want to distress preferably a CottageCutz die. I used Picket Fence Distress Crackle Paint, Vintage Photo Distress Ink, and the CottageCutz Fence. After cutting out the die, painted it with the distress crackle paint. The paint needs to be completely dry before you can go to the next step. If you are short on time let the paint dry for a few minutes and then use your embossing gun to dry it the rest of the way. You should be able to see cracks in dry paint. After the paint is dry, add distress ink to the die then rub the ink into the cracks (I used my fingers to do this). Take a damp cloth and rub off the excess ink. You will have an antique type finish look, or weathered look like my fence. This was a perfect technique for the fence on my layout. Here is how I used it on a layout. I also used the CottageCutz Windmill. If you've followed this blog for awhile, you know I like fun little sentiments to go with my cards and projects. This treat bag is no exception - do you get it?.....Did it put a smile on your face? Hope so! 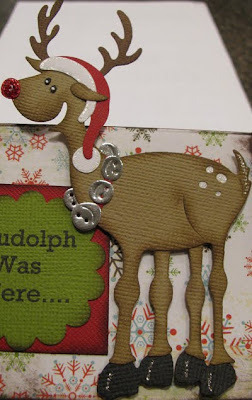 This CottageCutz Festive Reindeer has a fun whimsical look just perfect for my sense of humor. I cut him out of brown cardstock and colored his antlers and hooves with Copic markers and then cut out the eyes in black, the bells in silver metallic and the rest in white and red. I inked the edges of the brown and added some red Stickles to his nose. 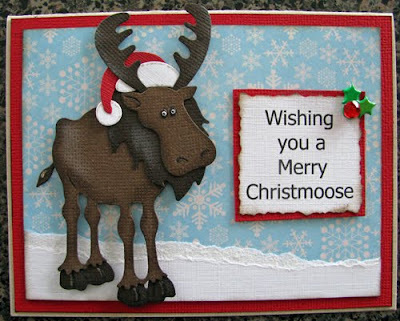 The great thing about his reindeer is you can make him with or without the santa hat and bells to meet your needs. 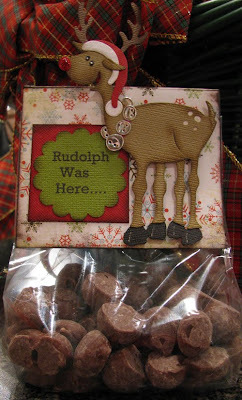 There are some great dies for the Christmas and winter season so be sure to check them all out at the Scrapping Cottage. I love the S'Mores shape! Mostly because of the versatility of it.. you don't exactly have to use them for camping! Thanks to everyone who entered the Cottage Cutz Camping Release giveaway!! Amber H - please contact The Scrapping Cottage to select your free Cottage Cutz die!! Congrats!! This little angel is a perfect helper for Santa! I am certain Santa will appreciate his help! Although sometimes help from a one or two year old can be more work then just doing it yourself!!! But oh what joy they feel being a helper!!! 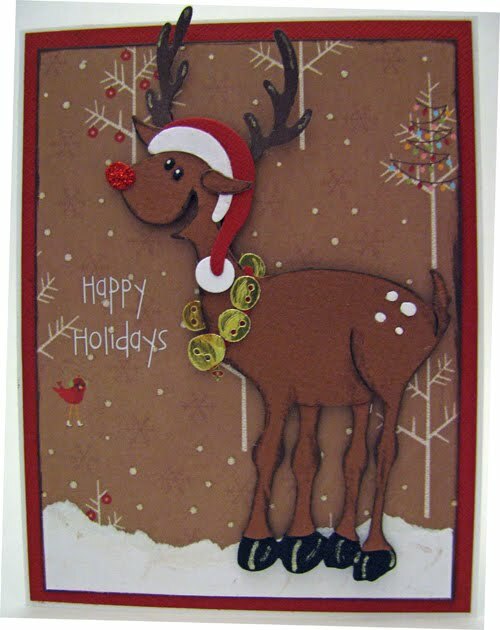 For this layout I used the CottageCutz Santa with Reindeer. Santa is standing next to a tree made out of buttons. If you look closely you can see I put distressing stickles on Santa's boots and on the big Quickutz Nesting Star. I put gold stickles on the small Nesting Star for the Christmas tree. We have another fabulous release of brand new Cottage Cutz dies - Camping!! But that is really just the start - there are some adorable animals, great lake-themed dies and other dies for just general outdoor fun. There is definitely something in this release for everyone!! Good luck everyone!!! I can't wait to see what your favorites are because I already have so many!! 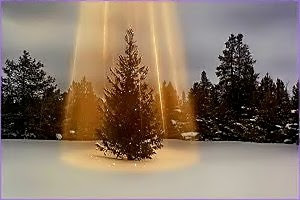 In Search of the Perfect Tree!!!! Lots of Space or Very Bushy? White Fir, Scotch Pine, or Silver Tip? of time, hot apple cider and dirty knees!! 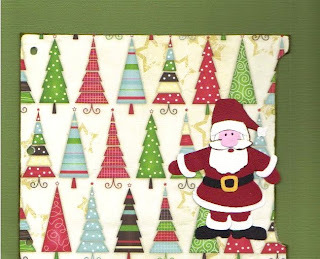 I just can't get enough of these Holly Jolly Cottage Cutz Shapes!! This Santa Claus Shape is one of my favorites from this release! I love that he is so realistic looking and that he is carrying that big pack of toys. I just knew he would look perfect on so many different Christmas layouts. 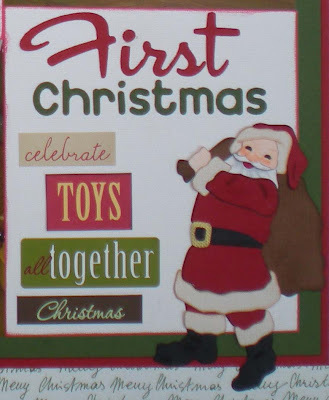 I used this Jolly Santa on a layout of my youngest daughter on her first Christmas morning. In addition to the Santa Claus, I also used the Cottage Cutz Mini Christmas Tree, the Cottage Cutz Mini Gingerbread man, and the present from the Elf with Present Shape. These cute litte mini shapes are so fun to decorate with Stickles! I also used shiny gold paper for the tree star as well as shimmery green paper for the tree itself. and are not very difficult to create! them up and put them away! merry books, see the very next post!